ROME, Italy, August 29, 2011 (ENS) – The UN Food and Agriculture Organization today urged heightened readiness and surveillance amid signs that a mutant strain of the lethal H5N1 bird flu virus is spreading in Asia and beyond. Vietnam, which suspended its springtime poultry vaccination campaign this year, has been invaded by a new virus strain, known as H5N1 – 2.3.2.1. Vietnam’s veterinary services are on high alert and are considering a targeted vaccination campaign this fall. Since the start of the most recent outbreak in 2003, the H5N1 highly pathogenic avian influenza virus has infected 565 people, killing 331 of them, according to World Health Organization figures. The latest was a six-year-old girl who died earlier this month in Cambodia. The Cambodian Ministry of Health reported poultry die offs in her village, and she is believed to have been in contact with sick poultry. Cambodia has registered eight cases of human H5N1 infection this year – all of them fatal. Most cases of bird flu infection in humans have resulted from contact with sick poultry or surfaces contaminated by infected birds. The spread of H5N1 from one ill person to another person has been reported very rarely. 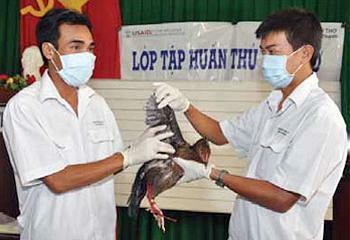 While the H5N1 virus was eliminated from most of the 63 countries infected at its peak in 2006, it remained endemic in six nations. Outbreaks have risen since then, with almost 800 cases recorded between 2010 and 2011, the FAO said in a statement. The resurgence of the H5N1 virus appears to be associated with migratory bird movements, says FAO Chief Veterinary Officer Juan Lubroth. He said migrations help the virus travel over long distances, so that in the past 24 months H5N1 has been found in poultry or wild birds in countries that had been virus-free for years. “Wild birds may introduce the virus, but peoples’ actions in poultry production and marketing spread it,” Lubroth said. Areas recently affected by the virus are found in Israel and the Palestinian territories, Bulgaria, Romania, Nepal and Mongolia. A further cause for concern, Lubroth said, is the appearance in China and Vietnam of the variant virus, H5N1 – 2.3.2.1, which appears to be able to overcome the defenses provided by existing vaccines. 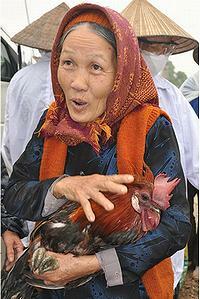 The mutant virus strain has appeared in most of the northern and central parts of Vietnam, where H5N1 is endemic. 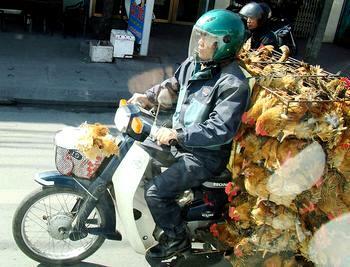 In 2003, Vietnam reported the world’s first human case of bird flu. In 2009, USAID supported Vietnam’s first hands-on training of animal health workers to prevent and control future outbreaks of the disease. Vietnam’s Ministry of Health launched this two-year field training program with the World Health Organization and the U.S. Centers for Disease Control and Prevention. USAID’s Richard Nyberg said the agency has also funded cross-border bird flu pandemic exercises with China and Laos and support to develop or improve provincial pandemic preparedness plans. FAO warned that virus circulation in Vietnam poses a direct threat to Cambodia, Thailand and Malaysia as well as endangering the Korean peninsula and Japan. Wild bird migration also can spread the virus to other continents. Bangladesh, China, Egypt, India, Indonesia and Vietnam, where the virus is still entrenched, are likely to face the biggest problems but all countries need to be vigilant, said Lubroth. “The general departure from the progressive decline observed in 2004-2008 could mean that there will be a flareup of H5N1 this fall and winter, with people unexpectedly finding the virus in their backyard,” Lubroth said. Since 2003 the H5N1 virus has killed or forced the culling of more than 400 million domestic poultry and caused an estimated $20 billion of economic damage across the globe before it was eliminated from most of the 63 infected countries.